Each one of the (50) FIFTY glass vials hold 1½ml of this precious GOLD leaf flake. The GOLD LEAF alone is in each bottle without any water or oil added period. Just a fantastic conversation piece or that very unusual gift. Made from real BRASS. the actual item weighs different amounts however its generally over a kilo in actual weight ( its heavy ). The Cans have a ceramic board inside as shown by photo (3) Very hard to open so we left it as shown. Everything in photos are included in sale.Approx. weight is 515 grams. Other photos depict both sides of the Cans. Country/Region of Manufacture Hungary. Country of Manufacture Hungary. 3.38 gr 0.900 gold 0.098 oz of pure gold. Composition Gold. Certification Uncertified. 3.2258 gr 0.900 gold 0.0933 oz of pure gold. FREE Trial ! Isle of Man 1997 Gold 1/10 oz 1/10 Crown Long Haired Smoke Cat Original Mint Sealed UNC. Certification Uncertified. FREE Trial ! Year 1872 A. 3.982 gr 0.900 gold 0.1152 oz of pure gold. Country/Region of Manufacture Germany. Composition Gold. FREE Trial ! Country of Manufacture Singapore. FREE Trial ! Country/Region of Manufacture France. 3.2258 gr 0.900 gold 0.0933 oz of pure gold. Composition Gold. Certification Uncertified. Year 1865 E. Country of Manufacture Austria. Country/Region of Manufacture Austria. 3.4909 gr 0.986 gold 0.1107 oz of pure gold. Composition Gold. Certification Uncertified. Composition Gold. Country of Manufacture Singapore. Country/Region of Manufacture Singapore. Year 1817Q. Circulated/Uncirculated Circulated. Country of Manufacture France. Country/Region of Manufacture France. 6.4516 gr 0.900 gold 0.1867 oz of pure gold. Composition Gold. Year: 2016. Certificate COA: Yes. Face Value: 10 Cents. Certification Uncertified. 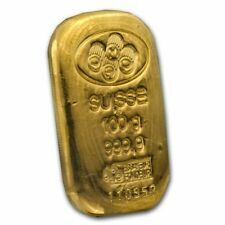 (x1) FIVE GRAIN 24K SOLID GOLD ACB BULLION MINTED BAR FINE Au 99.99. (x1) FIVE GRAIN Pure Platinum ACB BULLION MINTED BAR FINE Pt 99.9. Mikes Bullion Vault. Gold, Platinum bars you will receive Fineness 99.99 Gold. One Dwt EQUALS 1.55 Grams. 24 grains = 1 DWT=-pennyweight = 1.5552 grams. 2 DWT OF. 9999 PURE SOLID FINE GOLD. UN-circulated 24K Fine Gold Nugget 2018 Bullion Shot. 24k is used in jewelry has low amount of alloys to make it harder. Year 1817A. Country/Region of Manufacture France. Country of Manufacture France. 6.4516 gr 0.900 gold 0.1867 oz of pure gold. Composition Gold. Certification Uncertified. 1 Gram Pure Gold Bar 999.9 - ISRAEL'S 70th ANNIVERSARY - Special Edition!! Gold Coins. The bar is a perfect gift or souvenir for this historical milestone. The Gold Bar obverse depicts a dove flying over the Jerusalem hills. Silver Coins. Weight 1 gr. The product must be in its original box and original perfect condition. Mint Argor - Heraeus Switzerland. Gold Coins. Silver Coins. The beautiful gold bar featuring a dove in flight over the Walls of the Old City of Jerusalem. the Gold Bar obverse depicts a dove flying over the Jerusalem hills. Country/Region of Manufacture Peru. Country of Manufacture Peru. 1.5976 gr. 0.9170 gold 0.0471 oz of pure gold. Composition Gold. Certification Uncertified. Country/Region of Manufacture Luxembourg. 6.4516 gr 0.900 gold 0.1867 oz of pure gold. Composition Gold. Certification Uncertified. Modified Item No. THIS 100% SOLID GOLD 24K. 999 FINE GOLD. It's just a hobby of mine. Grade XF - AU. Country/Region of Manufacture South Africa. Country of Manufacture South Africa. 7.988 gr 0.916 gold 0.2352 oz of pure gold. Composition Gold. Certification Uncertified. 20 GRAMS OF 999.9 FINE GOLD. 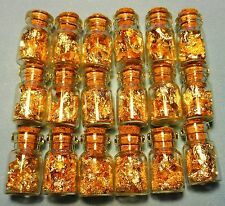 100 Large 3ml Vials, Filled Full of Gold Leaf Flakes! Get 100 vials Filled full of gold leaf flakes now! That’s an INCREDIBLE PROFIT! This gold flake is very beautiful. It looks like 24 karat. This gold leaf flake is the most beautiful I’ve seen! 0.917 gold 0.2353 oz of pure gold. FREE Trial ! JELENKO RAJAH MICRO-FINE DENTAL GOLD ALLOY. BURNOUT AT 1300° F (704° C) FOR ONE HOUR. CAST AT 1805° F (260° C) WITH FLUX. HARDEN BY HEATING TO 500° F (260° C), HOLD FOR 15 MINUTES AND BENCH COOL. PICKLE USING GOLD PICKLING ACID. This gold flake is very beautiful. It looks like 24 karat. This gold leaf flake is the most beautiful I’ve seen! The flakes are Huge. Great for gold filled vials, collecting, etc. NOT edible gold leaf. 4.5 out of 5 stars - 5 Grams of HUGE Gold Leaf Flakes! In Bag! Great For Gift Giving!!! Ships Free!!! 11 product ratings11 product ratings - 5 Grams of HUGE Gold Leaf Flakes! In Bag! Great For Gift Giving!!! Ships Free!!! Our flakes are large in size and have a wonderful yellow luster. Up for sale are big and beautiful Gold Leaf Flakes. The Buy It Now price consists of Decorative gold leaf flakes are a unique novelty item and have many uses. 1986 1 Oz. MINT: West Point Bullion Depository. Includes Box and CoA, which reads Copper. 058 troy oz. DATE: 1986. COMPOSITION: 91.67%, 3.00% Silver, 5.33% Copper. COIN ARTISTS Gold 1.000 troy oz (31.104 g). 3.994 gr 0.917 gold 0.1177 oz of pure gold. FREE Trial ! This popular incuse, or sunken relief, design is now available in fractional Gold sizes to accommodate any price point. Contains 1/10 oz of. 9999 fine Gold. The design of these rounds is based on the original coin issued by the U.S. Mint. KARATBARS 1 GRAM 999.9 FINE GOLD NADIR BAR In Warranty Certificate Coin. Shipped with USPS First Class Package. KIM THANH WAS A PRE-1975 REFINER/BULLION DEALER IN SAIGON AND HANOI IN VIETNAM, AS WELL AS PHNOM PENH IN CAMBODIA AND THE CROWN COLONY OF HONG KONG. THE BARS OR LEAVES OF GOLD OF. • Type: Gold Bullion Pendant. 3.994 gr 0.917 gold 0.1177 oz of pure gold. Composition Gold. FREE Trial ! Certification Uncertified. Country of Manufacture Sweden. Country/Region of Manufacture Sweden. 4.4803 gr 0.900 gold 0.1296 oz of pure gold. Composition Gold. Certification Uncertified. This is a great Gift Idea For Graduation Class. 1/2 Gram Istanbul Gold Refinery 24 Karat 9999 Fine Gold Bar. Front of the bar depicts "IGR" inside an oval. Just below is "0.5 g" and "FINE GOLD 999.9". Back of the bar has diagonally-repeating logos. Comes in a beautiful, dark blue assay card with attractive gold lettering. Unique serial number on the side of the card. Back of the assay card restates the weight and purity. It also displays the LBMA logo and hologram security label. SPECIFICATIONS: Metal:Fineness:999.9 Shape:Rectangular Size:8.62 x 15.33 x 0.19 mm. Net Weight:0.5 Gram Fine Weight:0.5 Gram Numbering:6 Numbers Packaging: Serial Numbered Assay Certificate Package.